A student at the Ecole des Beaux-Arts of two of the most prominent landscapists of the nineteenth century, Corot and Daubigny, as well as of Léon Bonnat, Damoye is best known as a painter of the Pas-de-Calais region between Paris and the English Channel. He made his Salon debut in 1875 with a work entitled L’Hiver, and was awarded a third class medal in 1879, a second class medal in 1884, and a gold medal at the 1889 Exposition Universelle. In 1890 a schism between Bouguereau and Meissonier regarding Salon policies caused the founding of a new Salon de la Société Nationale and Damoye became one of its founding members. He figured prominently at the New Salon, where he earned a reputation for carrying on the Barbizon traditions of his masters, Corot and Daubigny. He was inducted into the Légion d’honneur in 1893 and became a member of the Salon jury in 1900. 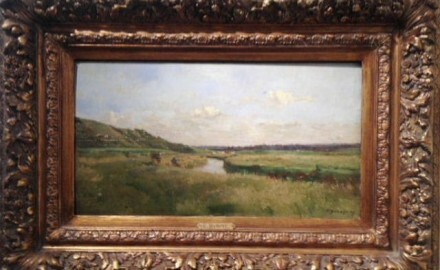 Bordeaux, Musée des Beaux-Arts; Paris, Musée d’Orsay; Troyes, Musée des Beaux-Arts; Bucharest, National Museum of Art.